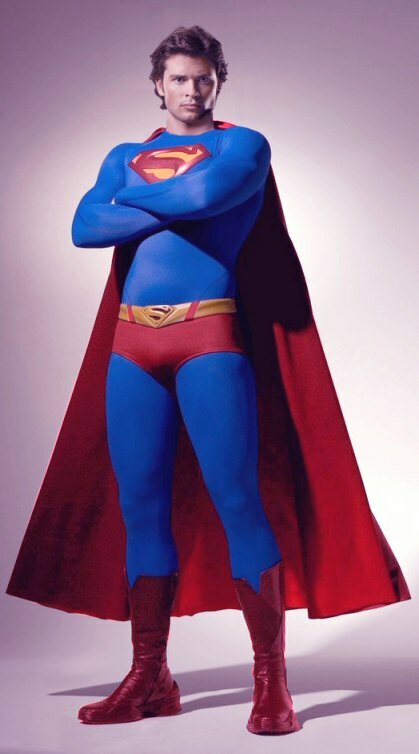 Having watched the season 10 finale or should I say "last ever episode" of Smallville recently can I please ask what the f**k was your problem with not satisfying your loyal fans who had waited 10 painful years to see something resembling the photoshopped image below on our screens? They, or should I say "we", only wanted Tom Welling in the damned suit, even for 5 seconds, maybe when he flew over the crowd of people before pushing Apokalips away (stupid bloody writing that was anyway) or even a closer shot in space, maybe a phonebooth quick-change and flight instead of the rooftop slow-mo scene? Something that was clear and full bodied... But no. As a loyal 10 year follower of Smallville myself I can safely say that you fed us a whole lot of crap over the years with bad episodes and shoddy writing (most notably for me the whole Doomsday debacle) and yes you had your moments of TV greatness, but you could have redeemed yourselves completely with 5 pure seconds of Superman-suit screen time and you didn't... Shame on you. My answer to that is this: "BADLY CONTROLLED DIABETIC BLOGGER + LOTS OF SUGAR = ANGRY, MINDLESS GIT WHO SAYS WHAT'S REALLY ON HIS MIND AT THE TIME".